Start Framing or Printing Now! Hello lovers! It’s the time of year to wear our heart on our sleeve and perform romantic gestures to show our love to those special people in our life. Maybe it’s your significant other, a dear friend, or recognizing the marriage two special people who’ve loved and supported you through thick and thin; we have all your Valentine’s Day gift ideas covered. Valentine’s Day gifts beacon thoughtful and meaningful gifts. Consider a keepsake that will stand the test of time. Here is The Frame Room’s Valentine’s Day line-up, ready to pump your brain full of wonderful and thoughtful gift ideas. Don’t want your gift to be tossed into a cardboard box and forget about it? Listen up! We have some amazing ideas. The best things in life are free! Today we are going to share some secrets just in time for the holidays! Did you know there are thousands of free high-resolution images available for download? With thousands of stock photos and images online there is sure to be something to pique your interest. The Frame Room can print any digital image in-house and frame them for one-stop gift-giving. Consider printing on a host of interesting papers such as metallic or pearl. Better yet, add more pop with a printed canvas! Some think adding art to our home or office is expensive or simply daunting and are clueless where to start. Gifting art to someone else can feel even more terrifying, but it doesn’t have to. I’m here to ease those worries! Here are some great ideas to get those creative juices flowing and stay on a budget. It’s all back to business now that summer is drawing to a close and schools are back in session. Are your office walls looking a bit bland or sparse? Maybe the same picture has been hanging on the wall for 13 years and you’re a little tired of looking at it. This indeed calls for an office makeover. Here are a few ideas to get that dreary office from funky to fabulous. It’s Fall ya’ll! This means a few things to us, the first is that the holidays are already knocking on our door. The second, which is a bit less terrifying, is that it’s FESTIVAL TIME! Maybe just go ahead and tuck that holiday idea into our back pocket while trotting along the vendors and artists at all the splendid festivals this season. One of our favorite events is the Fells Point Fun Festival, held on Saturday, October 13th. Come and check us out! 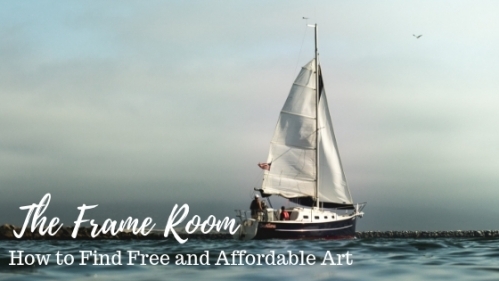 The Frame Room, located at 1706 Aliceanna Street in Fells Point, will be open for business during the Fells Point Fun Festival. We will also have a large booth, which will have a variety of frames, prints, posters, and canvases on hand and ready to go home with you. I know, I mentioned the holidays, but don’t fret my friend. We got you covered! Summer May Be Over. Memories Live On! The long days of summer are coming to an end in just a few weeks. Many of us love the long warm days and extra sunshine that comes with the season. I’m going to bet that you took hundreds of photographs with your phone or camera over the last few months and you haven’t done anything else with them. Maybe you posted the best shots on social media so everyone knows just how gorgeous you are. There’s nothing wrong with that! Summer is meant for capturing memories with family and friends and the different places we visit. Even though summer is wrapping up there is no reason you can’t preserve these treasures indefinitely. There are so many framing options and other amazing ways to store and display your summertime keepsakes. If you are creating a gift for someone else or a little special memento for yourself, here are a few ideas to get you started. This was a long and fevered process but with a dynamic and meaningful ending. It involved a lot a pre-planning, over- the- phone designing for a garment that was old, tattered, and fragile. This was also meant to be a surprise for their wife/mom for her upcoming birthday and her daughter’s subsequent wedding. The original plan was for the daughter to wear the wedding dress during the ceremony but considering the age, color, and fragile state of the garment it was best to preserve the dress inside a frame. The dress was about 75 years old being handed down from generation to generation. 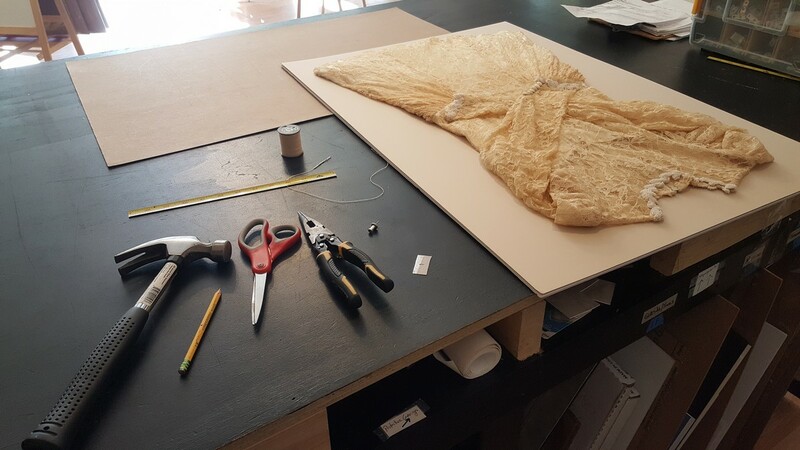 The father and daughter really wanted to do something special to prevent further deterioration and to present the dress in a way that future generations could proudly view and appreciate a family heirloom. I noticed right away that there would be some issues in mounting and handling but nothing that proper planning and the right materials couldn’t fix. When I first saw the tapestry it looked like a nice comfortable blanket you’d want to wrap yourself in on a cold winter evening. It was obvious that this particular blanket was not intended for cuddling or keeping warm but rather for displaying and viewing. 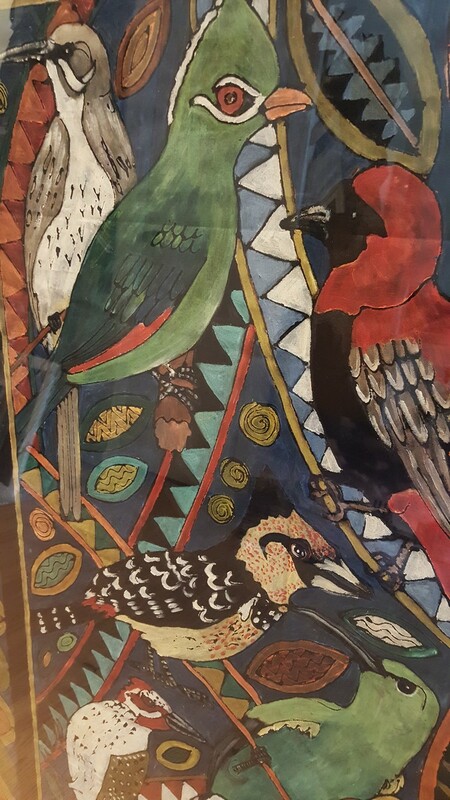 The blanket was nicely painted with indigenous South African birds, a simple and engaging design, and subdued but vibrant colors. 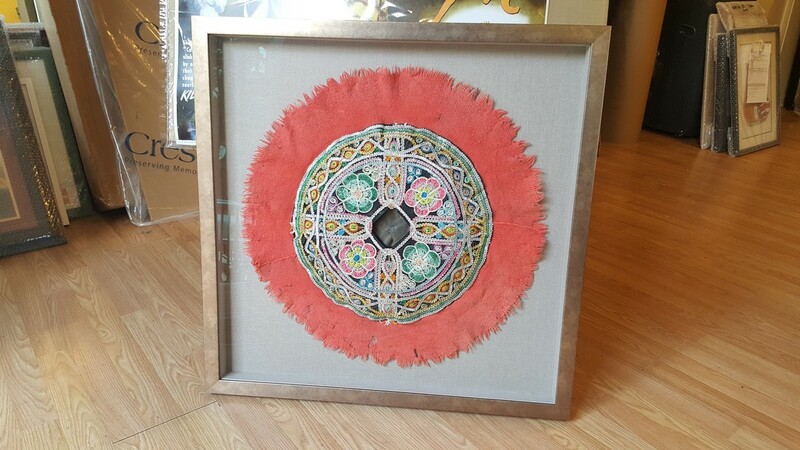 The initial thought was to treat this blanket like most tapestries and rugs which is to float them on a mat board in a shadowbox frame. Considering how squared up the blanket was it seemed unnecessary to make a shadowbox, other than personal desires and aesthetics. The customer was adamant about protecting and preserving the blanket as best as we could without compromising the overall look and feel of the blanket. Most conventional fabrics need to be sewn down in a methodical manner to ensure it will not fall and bunch up over time, resulting in unflattering wrinkles and shadows. Because this blanket measured well on all sides it was decided that we should “sandwich” the blanket between a UV protected acrylic and an acid-free backing which would enclose the blanket in an optimum environment. This would also help the blanket stay flat and clearly visible with the acrylic firmly pressed against it on all sides. There was no worry of sticking or possible damage because we were using a framer’s grade acrylic which is fairly unbreakable and flexible. If we decided to go with a UV protected glass, the glass could potentially damage the fabric because of possible condensation and breakage. Encapsulation is an excellent method one can use when framing a piece of artwork that is fragile, valuable, or unsuitable for traditional top mounting. 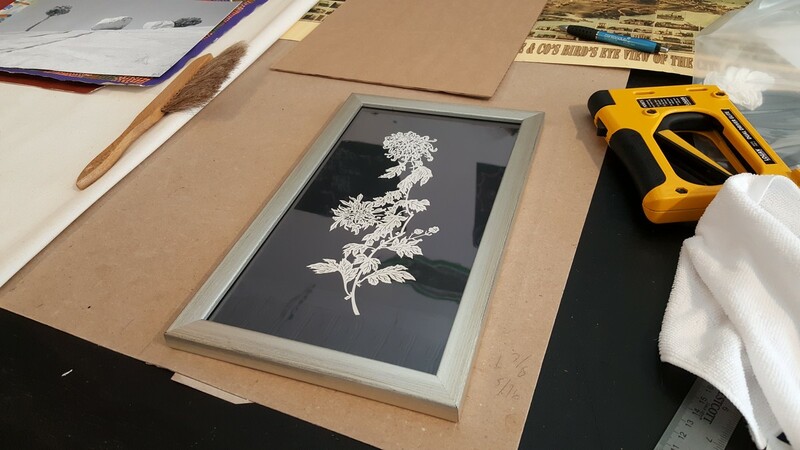 It usually involves many layers, mat windows, and rigid backings as well as some type of transparent film to cover the artwork being protected. There is a lot of designing and preparation involved in an encapsulation, if the artwork is to be properly protected and viewed. Objects and artworks that tend to be encapsulated are: magazines, baseball cards, paper cuts, very old paper, dried flowers, coins, and of course valuable fine art. The film which holds the artwork is usually a strong, durable, acid-free clear film known as Mylar. Other films, acrylics, and sheer fabrics also can be used, but Mylar is the best film for most encapsulations because of it durability and transparence. Some encapsulations can be two-sided; to get a better view of the artwork both front and back and to make sure it’s properly sealed. This is sometimes done out of necessity but usually is a desired aesthetic effect. The whole process of encapsulation can take some time and involves quite a bit of labor and high-quality materials. If done properly, the artwork being sealed will stay protected for decades to come and the integrity of the artwork will remain true with little to no deterioration. The hat was from Peru and it was quite becoming. The customer owned the hat for some time and finally decided to properly display it for herself and for her new apartment. It was a very interesting hat, which had a black cap for the top of the head, covered in a myriad of colorful sequence and patterns surrounded by a faded reddish brim which was made of a feathery cotton material. The underside of the hat was a very soft material perfect for wearing hours on end or possibly for a traditional ceremony. The customer was keeping the hat in storage for some time and wanted to finally display it in a more fashionable/presentable way to show off its craftsmanship and to help preserve it from further deterioration. When it came to the design, the customer didn’t have any preconceived notions about color and feel, she just wanted it to look nice, simple, and complimentary to the colors and style of the patterns and design. When the customer came in with what look like a small horse saddle, I started to get a little anxious and a bit worried about finding a substantial frame and the adequate materials for such an ambitious frame design. I was mostly concerned about the possibility of design complications, proper securement, debris collection, and feasible execution in a timely manner. I’ve framed many intricate, heavy, unconventional, and bulky objects in the past but nothing quite like this. 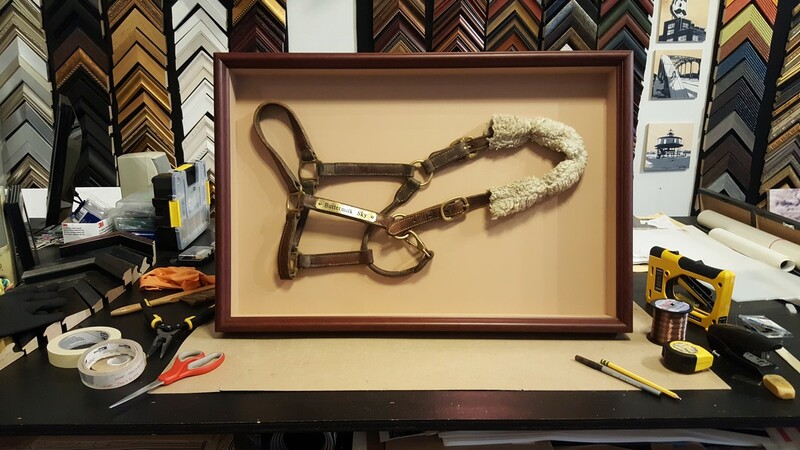 When the customer set the small saddle down and asked if it was possible to frame it within a few weeks, I was immediately reticent and unsure if it could be done in a timely manner with quality materials and execution. But after some examination and asking a myriad of questions, it was becoming more and more clear that this saddle would be a good candidate for a shadowbox. Photo, Poster, & Canvas Printing. No Framing. Subscribe to our mailing list for savings & new products!! © The Frame Room, LLC. All Rights Reserved.